The screenwriter is the writer of the script of a film. They create the dialogue, the characters and the storyline of a movie script. 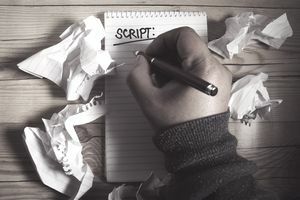 The screenwriter is often the most essential person in film production because no movie can start without some form of a script. Like television writers, screenwriters often specialize in a particular genre. Comedy writers write comedy; drama writers write drama, science fiction writers write sci-fi and so on and so on. Screenwriters are extremely adept at weaving together visual elements within plot and dialogue. It is their work that provides the directors, producers, actors, and executives a project to work on in the first place. Many people are under the incorrect belief that one must attend film school or have a degree in creative writing to be a successful screenwriter. While in fact, most screenwriters initially started out in other disciplines whether it be an advertising executive like Lawrence Kasdan or a history teacher like Steve Faber. There are numerous creative writing courses that you can take that will help you develop your craft, but the fastest way to becoming a good writer is by writing. In writing screenplays, the simple act of writing a script from beginning to end is like taking a class. Screenwriters truly come from all walks of life, and it's that life that makes them unique. The "voice" of a screenwriter is developed from the life they lead. They provide unique and engaging characters using their past experiences. Many screenwriters will tell you that they base the characters, plot lines and much of the dialogue of a script on real events, places and people they've come across. Thus, it is essential that if you plan on becoming a screenwriter that you begin by observing the world around you. The best screenwriters are students of life. They observe people, places and things on a higher plane. They watch interactions and relationships with great interest because they know that they might be able to translate those experiences into stories later on. Learn to observe and write as much as you can. Screenwriting is truly one of the more difficult careers because there is nothing more daunting than staring at a blank sheet of paper and trying to give it life. Almost all writers no matter how successful will often tell you that writing is the hardest thing they have ever done. The key is to develop passion, persistence, and patience. A good story takes time to develop. Characters need a writer to give them life, and if you rush the process, you're inevitably going to be disappointed with the result. One last piece of advice is to never write for money. That doesn't mean don't get paid for your work; it means if you're getting into screenwriting because you think it will make you rich, then look to other careers. The financial rewards are certainly there, but only for those who develop their craft first.